Further ticketing information coming soon. If there is a queue in place to buy tickets for DEAR EVEN HANSEN please only open one browser window as multiple windows will increase the queue length for everybody else. Once you are in the queue do not refresh the page as you may lose your place or drop further back in the queue. If you are booking via mobile, please keep your browser open and do not allow your phone to enter stand-by mode, as mobile phones will automatically disconnect the session and you will lose your place in the queue. Thank you for your patience while queuing. We will update ticket availability on Twitter @DMTWestEnd and also on the queuing page. Can I cancel, re-sell or exchange my tickets? We cannot cancel and refund tickets but you may be able to exchange into a different performance. This restriction is in place in order to give as many people as possible a fair chance to buy tickets to see DEAR EVAN HANSEN. What are the performance dates and times? Performances will be from 29th October 2019 at 7.30pm Monday – Saturday and 2.30pm for Wednesday and Saturday matinees. Standard tickets will be from £15 and premium tickets will be available from £100. All prices include a £2.50 booking fee. You will be able to buy Hospitality packages for DEAR EVAN HANSEN from Monday 8th April 2019. Champagne packages will be from £145 person and VIP receptions will be available from £199 per person. For full details of what our Hospitality packages include please click here. Can I buy in person at NoËl Coward Theatre Box Office? You will be able to buy in person at the theatre from 8th April 2019. Can I use Theatre Tokens or DMT Gift Vouchers? Yes you can use SOLT Theatre Tokens or DMT Gift Vouchers to pay for your DEAR EVAN HANSEN tickets. Delfont Mackintosh Theatres are keen to ensure any customers who have specific requirements due to health conditions or a disability have an enjoyable visit to all of our venues. Due to the high demand for DEAR EVAN HANSEN tickets and our desire to enable as many people as possible to see the show as early as possible, we are unable to accommodate any group bookings as part of the priority booking period. 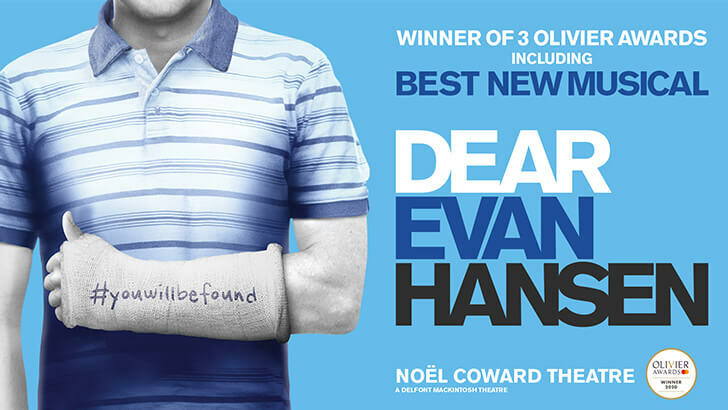 Tickets for DEAR EVAN HANSEN are expected to be dispatched within the next 6 - 8 weeks. Yes you can buy tickets for someone else if you select to have your tickets posted to you. If you choose to collect your tickets from the box office, the credit card holder should be present so we can check identification and therefore prevent potential fraud. No third party can collect tickets on behalf of someone else. Can I bring children to a Delfont Mackintosh Theatre? I can’t find the answer to my question, who should I contact now? The running time of DEAR EVAN HANSEN is 2 hours 30 minutes, including interval. *All prices include a £2.50 booking fee. Booking fees do not apply to tickets purchased in person at the box office. To add some extra sparkle to your evening, why not upgrade your Dear Evan Hansen booking to one of our Champagne or VIP Packages? Prices start from £145.00 per person, inclusive of VAT.